Igor SANNIKOV is a former circus musician who, from 1954 to 1984, worked as a saxophonist in the Kino-jazz group of the Mikhail Kachuriner Musical-Eccentric ensemble. From 1984 to 1986 he was the ensemble?s director. His work in theater began in 1989 with two shows: Boris Lvov-Anokhin?s production of Hollywood Tales at the Maly Theater and Roman Viktyuk?s production of Edvard Radzinsky?s play Our Decameron at the Yermolova Theater. As a member of the cast of Snow White and the Seven Dwarves, he performed for four months in Oslo, Norway, at the Viktoria Theater and continued performances of this show on tour in Germany from 1993 to 1995. 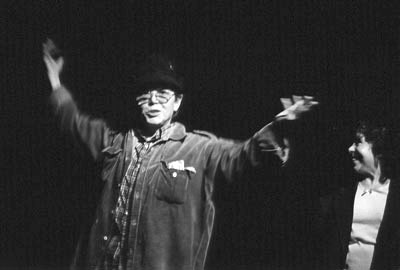 He was again invited by Lvov-Anokhin to perform in The Novellas of Margaret of Navarre, this time at the Novy Drama Theater (1996), where he later performed in Andrei Sergeyev?s production of Jourdain, an adaptation of Moliere?s Le Bourgeois Gentilhomme (1998). In a film career spanning four decades, his film and TV credits include: A Nasty Anecdote (1964), The Republic of SHKID (1966), The Scarlet Flower (1991), Mad Dog Kol (1991), Snow White and the Seven Dwarves (Czech Republic, 1992), Kotovasiya (1997), Beauty Queen (2001), The Frenchman (2003) and Kolkhoz International (2003). Two of his most important feature film roles were performed in Nikita Mikhalkov?s The Barber of Siberia (1997) and Alexander Abdulov?s The New Bremen Musicians (1999). He is currently shooting in the TV mini-series The Lady Taxi Driver, which is expected to air in late 2003. His memoirs, I Go to the Circus, are to be published in book form in late 2003. He performs the role of Gray, who is also Sancho Panza?s guardian angel, in Quixote and Sancho.